October 7, The Iran Project – Iran’s ballistic revenge annihilates terrorists, IRGC strikes ringleaders of Ahvaz attack east of Euphrates; We can’t start all over again with US: FM Zarif; IAEA says its independence is paramount after Israel’s Iran allegations; IRGC releases images of ground zero after missile attack on terrorists in Syria; Two advanced homegrown submarines join Iranian navy’s fleet; Victory for Iran: Highest UN court orders US to suspend sanctions; US cancels 1955 Treaty of Amity with Iran after UN court ruling; Iran will slap US in face by defeating sanctions: Ayatollah Khamenei; Iran’s Zarif meets with group of anti-Zionist Jews in New York and Iran parliament approves bill on Combating the Financing of Terrorism (CFT) are among major headlines dominated the country’s media outlets in the past week ( October 01– October 07). Iranian Foreign Ministry Spokesman Bahram Qassemi rejected Israeli Prime Minister’s recent speech at the United Nations General Assembly about a “secret nuclear warehouse” in Tehran and said his claims are “more like a joke”. Leader of the Islamic Revolution Ayatollah Seyyed Ali Khamenei says the annual Hajj pilgrimage demonstrates the power of the Islamic Ummah and boosts contacts among Muslims. Iranian Foreign Minister Zarif told The New Yorker that any prospect for talks with US hinges on a relationship based on some “foundations”, saying that Iran is waiting for some sense of “realism”. Member countries of the quadrilateral committee to exchange security information on Daesh, including Iran, Russia, Iraq and Syria, underlined here on Monday to strengthen the committee and make it more active to combat terrorism. The U.N. nuclear watchdog has said its independence is paramount and it does not take intelligence presented to it at face value, in an apparent response to Israeli Prime Minister Benjamin Netanyahu’s description of a “secret atomic warehouse” in Iran. Alebaa News announced that an ISIL ringleader has been killed during IRGC’s missile attack at militants in Syria over Ahvaz military parade attack. The Islamic Revolution Guards Corps Aerospace Force released the photos of the sites used by terrorists that it annihilated in a recent missile and drone attacks inside Syria. The Iranian Navy on Tuesday added two state-of-the-art domestically made submarines to its fleet in the country’s southeastern coasts of Makran. 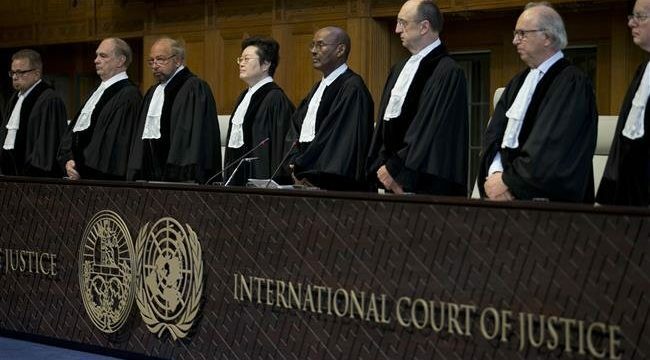 US Secretary of State Mike Pompeo says Washington is canceling a 1955 treaty with Tehran after the International Court of Justice (ICJ) ordered the United States to halt the unilateral sanctions it recently re-imposed on “humanitarian” supplies to Iran. Iranian Foreign Minister, Mohammad Javad Zarif met with a group of anti-Zionist Jews. The Iranian Parliament held an open session in the morning to review a bill on Iran’s accession to Combating the Financing of Terrorism (CFT). Saudi Arabia’s crown prince, facing U.S. pressure to tame surging oil prices, insisted that the kingdom is fulfilling promises to make up for Iranian crude supplies lost to American sanctions. France says the European Union must use the ongoing row with the US over the Iran nuclear deal as a chance to increase the bloc’s financial autonomy and stop following Washington’s lead in its trade relations with the world. This week, Russian President Vladimir Putin called Washington’s sanctions policy a “colossal strategic mistake” which has only served to undermine the dollar’s credibility as a global reserve currency. The new US sanctions will not have a major effect on Iran’s financial and oil activity, Iranian Central Bank Governor said Friday. Russia’s defense minister says the delivery of S-300 air defense systems to Syria has been completed. The lawmakers at Iraqi parliament have elected the Kurdish politician Barham Salih as the new president of the country in a Tuesday session. The head of Iranian Space Agency (ISA) Morteza Berari announced that three domestically-made satellites have been completely built and are ready to be launched. The 2018 Asian Para Games officially began in Jakarta on Saturday attended by athletes with various disabilities coming from different countries. The head of Iran’s Cultural Heritage, Handicrafts and Tourism Organization (ICHHTO) says the number of foreign tourists visiting the country surged 51% in the first six months of the current fiscal year (started on March 21) in comparison with similar period last year. Heavy rains in the northern and northwestern parts of Iran over the past two days claimed the lives of at least seven people, semi-official ISNA news agency reported on Saturday.